Cabinet card measuring 4.25 x 6 inches (the edges have been trimmed, in addition to just being damaged). Good grief, another history lesson! I sometimes like to thank my blog’s subscribers by posting photos of their interests (dogs, cats, photo booths, etc.) or photos from where they live (if only generally), and one of my subscribers is a woman from Italy (her blog is a quirky combination of politics and knitting). So I had this cute photo with Italian writing on the back, and I thought, “Perfect!” Well, silly me for thinking it would be that easy. It turns out this isn’t Italy at all. Fiume is an old seaport in Croatia that has had a long history of changing hands under various occupations. While Italy occupied it for a time, that didn’t happen until later. But when this photo was taken, in the years leading up to WWI, there was such an influx of Italian immigrants that for a time there were more Italians than native Croats in Fiume. My guess is that these boys (brothers, I’m assuming?) 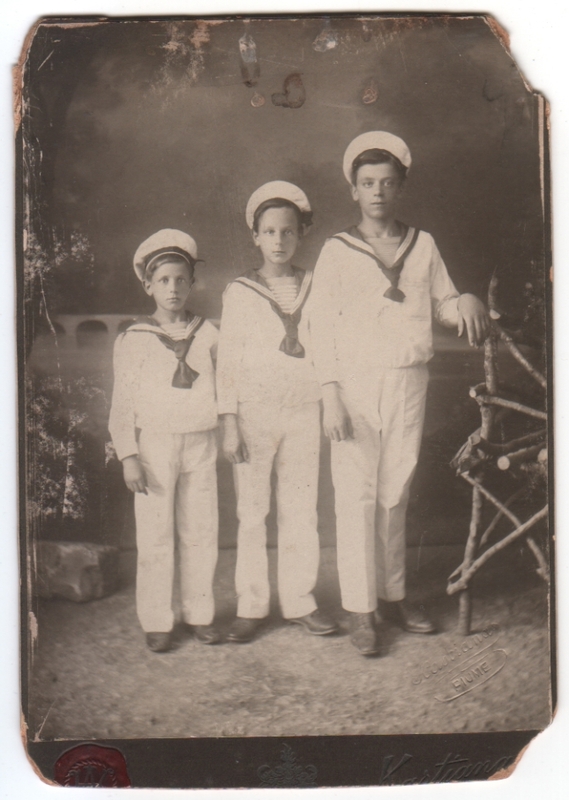 were among the Italian immigrants in Croatia, and that the photo was being sent back to a relative in Italy. In any case, despite all the damage, I think the photo is adorable. Does anyone have any idea what that wooden contraption is to the right? I’m intrigued by what seems to be a sealing wax stamp in the lower left, and I’m sorry that it is half cut off since I don’t recall ever seeing one on a photo. I found a reference to a Croatian photographer of that period named Eduard Kastiana, but I don’t know if that’s the same Kastiana as this one. And incidentally, it was after WWII that Fiume’s name was changed to Rejika and it became a part of Yugoslavia. That thing is just a posing prop – looks like some kind of planter. These bits of rustic furniture were quite common at that time period – if you look at any number of comparable period American cabinet cards, you’ll see the same kinds of things in the studio, from fake garden fences to outright furniture. It didn’t matter that the subjects were wearing formal fancy dress clothes, or in this case sailor suits. Thanks for your comment. Yes, I figured it was just a posing prop, but I wasn’t sure what it was supposed to be. A planter is a definite possibility. I was thinking perhaps a chair, though it’s extremely rustic. But then, with the stone and plant and sandy ground, perhaps the entire setting is supposed to be some rustic locale where our “sailors” have come ashore? If it’s not a planter, it could well be the back of a rusticated chair. No matter – these props often didn’t make a whole lot of sense. Someone pointed out to me in a comment about a photo of a bicyclist that lots of studios had a prop bike for people to pose with even if it was obviously the wrong size/gender of bike. I have a tintype where someone posed with a book, trying to appear educated, but the book is upside down, and it is an accounting textbook, which makes me wonder if he was illiterate, or just too nervous posing to realize he was holding the book upside down. I think a lot of these things are signposts in the journey of global fashions. It could just as well have been a trend – “all the smart people in (name your global fashion capitol) are having their pictures taken with twig furniture, so we’ll show how sophisticated we are here in Croatia by doing the same thing”. Yes, agreed. For instance, here is one I posted a while ago that shows a cartoonishly rustic fence that could be said to be the fence equivalent of whatever odd piece is pictured with our sailor boys: https://picsofthen.com/2011/08/06/young-man-with-a-fake-fence/ Do they represent styles that influenced each other, or is it just a coincidence? I really couldn’t say, but maybe somebody else could. Re: clothing, I am fortunate that some of the people who comment on my blog have some vintage costume expertise, because that’s not expertise I have either. In addition to dating a photo, they can help with things like pointing out that somebody is in mourning, or that a dress seems to have been made of recycled panels of older dresses, etc., which I find interesting. The internet can be very useful when trying to figure such things out, but sometimes I don’t even know what so search for (for instance, what is a particular style of jacket or hat or shoe called? ), and my lack of expertise really shows. lol Meanwhile, that photo collectors meet sounded wonderful! (I read about it on your blog.) Things like that can be really overwhelming, but can also be inspiring. Yes- the collectible image show (for lack of a better name for it) was tremendous. It’s a great opportunity to see a lot of images of really any kind in a single space. Fortunately I’ve got the discipline from past collecting habits (used to do coins) to be able to scan the room quickly and then narrow in on specific tables to spend more time at. Otherwise it IS overwhelming. Especially the postcard room – even though the postcard vendors have their wares categorized, it would be very easy to spend way too much time at each vendor’s tables (some of the postcard vendors had four or five full-size folding tables completely covered in boxes of postcards and stereoviews. Even browsing for daguerreotypes in the main room was a bit challenging, as there were more on display there than I had ever seen anywhere at one time. Literally over a thousand in a single room, ranging in condition from “I wouldn’t pay $5 for that to re-use the plate!” to “Now, I wonder if he’d take a kidney and half my liver in trade for that… livers grow back, don’t they?”. Fascinating story behind this one. I often think “I’ll just take five minutes to do a quick post” and then something I’ve never notice in a pic pops out at me and I end up doing loads of googling and writing and 2 hours later I’m still not finished. Such super things can emerge from a pic that surprise and delight! I am so glad there are others who can give me the fun of exploration without having to do the work myself. You and Scott at DC Photo Artist are particular heroes.